Zayn Malik is quite a favorite among female fans of the band One Direction. Among the tattoos he has on his body are a Yin-Yang symbol, crossed fingers (as a symbol of good luck) and a Chinese character symbol which he later had covered by a heart shape. It’s no surprise that Zayn has some tattoos in Arabic script – his father is of Pakistani heritage and languages such as Urdu are written using Arabic letters. So in a way it is a fitting tribute to part of his identity. As to his Arabic tattoos, the first one is located on his chest and simply spells the name “Walter” with Arabic letters. Apparently, this is the name of his grandfather – quite a sweet thing to do to remember a close family member. His second tattoo in Arabic is somewhat of an odd one. While it is normal to simply spell non-Arabic names with Arabic letters and not to translate them, it is a little weird to do the same with normal language. 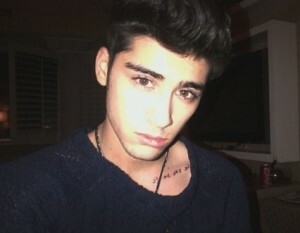 In fact, Zayn has written “bee troo too hoo yoo ar” on his collar bone. Confused? Well, this is what it sounds when you spell “be true to who you are” in Arabic. To tell the truth, I would have preferred it if this phrase had been translated into proper Arabic rather than simply to write the English sounds with Arabic letters. Christina Perri is probably most famous for her song “Jar of Hearts”. It’s a well-known fact that she has something like 50 tattoos, among them the Philadelphia skyline, an image of her French bulldog and an Italian tattoo that says “my family”. Her Arabic tattoo says “maktoob”, which means “it is written” and refers to the idea that everything is pre-ordained by God (or in some other sense), because it has been “written” in the book of life already. It’s similar to the notion of “fate” or “destiny” in English. The actress Zoë Kravitz is famous for her part in the movie X-Men: First Class and her role in the TV series Californication (and also for being the daughter of singer Lenny Kravitz). She has quite a few tattoos, among them one in Arabic on her left upper back. The tattoo is grammatically incorrect. Literally, it says “let the love the rule”, where “rule” could equally mean “camp, or base” and co-incidentally, is the word that has come to be associated with terrorist group Al-Qaeda, which derives from Qaedat al Jihad, meaning “the base of jihad”. I am guessing that the tattoo was meant to say “let love rule”, which is the title of one of her father’s songs. In its current form, the Arabic writing doesn’t make any sense whatsoever, as “qaeda” does not mean “rule” in the sense of e.g. ruling over a country, but more in the sense of grammatical rule. British actress Kym Marsh (formerly Kim Ryder) is an actress in long-running UK soap opera Coronation Street. She has the names of her two children David and Emily spelt in Arabic letters on her left arm. Straight above this Arabic tattoo she has the Chinese character symbol for “woman”. The second Zoe in our list of celebrities getting inked in Arabic! This one is known for playing Uhura in the new Star Trek movies. She also appeared in quite a range of other famous movies, such as Pirates of the Caribbean and Avatar. The tattoo on her foot is pronounced “ureed yu as’alha”, where only the first and the third word are Arabic words meaning respectively “I want” and “I ask her”. Together they would mean “I want to ask her”. However, the “yu” that is inserted in the middle doesn’t make any sense. On a second look, the Arabic letters might form two words, perhaps names? – Aridio (or Oridio) and Asalia (or Osaliya). Unfortunately, I was unable to get a better picture of the tattoo on Colin Farrell’s back. While there certainly seems to be some kind of Arabic writing, it’s impossible to make out what it says. It could also be the case that this is not Arabic at all, but rather some kind of decorative symbols. If any of you know of a picture that gives a clearer view on the tattoo, please let me know in the comments. If you’re looking for accurate and unique Arabic tattoo designs, then check out my new Arabic Tattoos collection. This entry was posted in Tattoos and tagged celebrities, christina perri, colin farrell, kim marsh, love, maktub, Tattoos, zayn malik, zoe kravitz, zoe saldana by ArabicGenie. Bookmark the permalink. Colin Farrell has a tattoo on his wrist that reads “الحرية” which means freedom. And i think a better translation for Zoe’s tattoo would be “دع الحب يقود” or “دع الحب يحكم” because يسيطر actually means “controls” not “rules”. Whoever translated it to her messed up pretty badly, I’m guessing she used an online translator. :القاعدة” is the noun “rule” not the verb. Thanks Yara. Yes, this is a good translation for Zoe’s intended meaning. The tattoo certainly looks rather strange in its current form. Do you happen to have an image of Colin Farrell where the tattoo on his wrist is visible? Here you go http://linvant.nl/colin-farrell-tattoos/. Howeve, it first caught my attention when I saw him on the Ellen show last week. Thanks Yara, I have updated the article with Colin’s wrist tattoo. Hi Alexis! Unfortunately, that writign is seriously wrong – it’s written in the wrong direction and the letters are disconnected. How are you? I hope everything’s well. “Hope” tattooed but i want it in arabic. Hope in Arabic is أمل. Can someone translate beautiful soul for me? I’ve had it translated more than once and each translation came back different every time. I love your site, is very rich in information and helped me a lot, I found the words he needed. I wonder if you can translate “forever yours” to man and woman. I read here on your page that is handled differently for “he” and “she.” We want to celebrate our 15th wedding anniversary with an arabic tattoo. Thank you very much. I would like to have ” freedom in god” tattoo but I am get so confused with translating:(does anyone can help?? I wanted to tattoo “Love” in arabic on my back years ago and I did a lot of research and my mother also speaks some Egyptian Arabic and can read also. She saw what i wanted and said “yes that says love” so I decided to do it, I tattooed Al hub In arabic script.. recently i wanted to add something to my tattoo so that it says “love yourself first” I realized that my tattoo is wrong it doesn’t say “love” it says “the love” Im really confused if that’s what it means because that makes no sense at all! I need answers! Someone please help me. if it Does mean “the love” Does that make sense in Arabic? and can I change my tattoo to “love yourself first” if I wanted to, is there any possible way with Al-hub? zoe saldana’s one is definitely names, her parents do have those names. No it isn’t wrong, what you are referring to (Al alta’areef) is used to distinguish love as a proper noun; to describe the concept of love rather than it being mistaken for love as a verb (depending on the pronunciation). Now, for your addition “love yourself first” I think the best way since you have ALhub is to say “أنَاأَوْلَى بِالحُبْ” which is pronounced “Ana awla bilhub” and loosely translates to “I am ~rightly/most~ deserving of love” Diacritics or tashkeel is really important otherwise it could mean “I am primary of love” and that doesn’t make sense. Perhaps to simplify you can say “أنَاالحُبْ” pronounced “Ana alhub” and it means “I am love” which is also pretty and poetic. Hope this helps, I’d wait for the genie’s confirmation before doing anything though! Good luck! How do you spell “Norma” im arabic? Norma is spelled like this, نورما. What is the correct translation for “be true to who you are” in Arabic? I’ve wanted the tattoo for years but don’t trust the translations I have found. Please help so many different translation? ??? Hi I have been wanting to tattoo in Arabic, but I have not had luck being able to translate. Can someone please help, my last name is Medina.